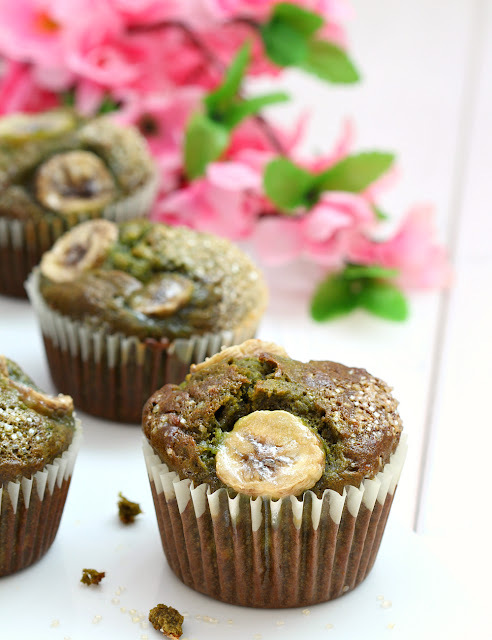 my bare cupboard: Banana-green tea muffins "
This is my to-go banana muffin recipe whenever bananas are on sale at the supermarket . I seldom buy this fruit for eating , I like banana just fine but eating it for 3 days straight is not my cup of tea . As with most Nigella's recipes , this one is a keeper . I've tried substituting the original cocoa powder with Milo ( I added 50 grams but the flavour was muted ) and so far , my favourite is the green tea version . As you can see from the photos , muffins look really tall which I really like , just like the ones they're selling in some bakeries here . But unlike most store-bought muffins , this version is wonderfully-soft and full of green tea flavour . As with most muffin recipe , don't over mix the batter . I found that sifting the dry ingredients into the the wet resulted in less lumpy batter . I'm using a table top oven , so I can only bake 1 pan / 6 muffins at a time resulting in not so uniform muffins . I used 2 sizes of liners and the muffins baked in taller liners tend to look better ( see photo below , first 6 one from the top ) . * Preheat oven to 200ºC . 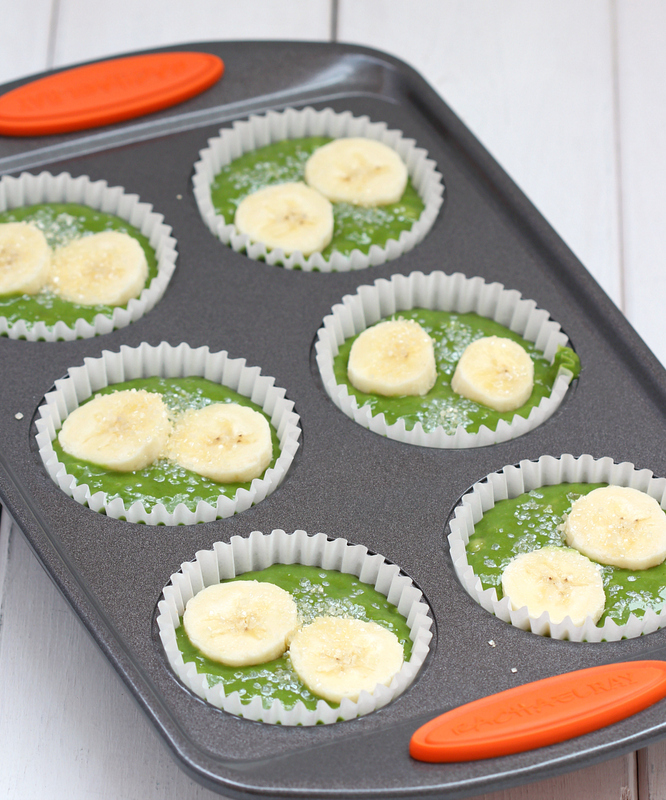 * Line muffin pan with liners , set aside . * Combine flour , green tea powder and baking soda in a small mixing bowl , set aside . 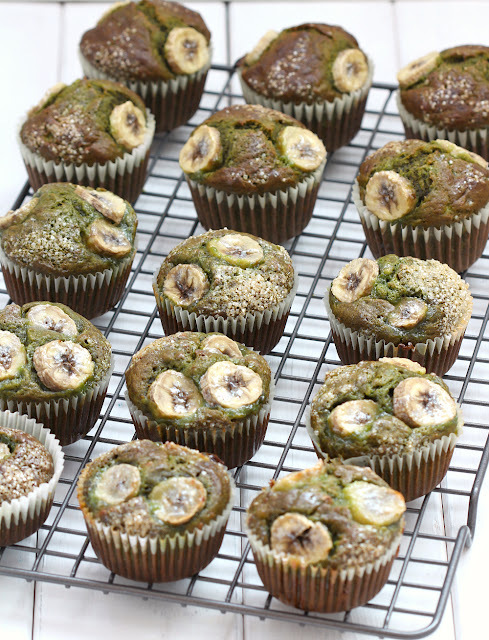 * Combine bananas , oil and sugar in a large bowl and use whisk until well combined . Add in the eggs and whisk for about 1 minute . Sift in the flour mixture into the banana mixture and stir until just combined . 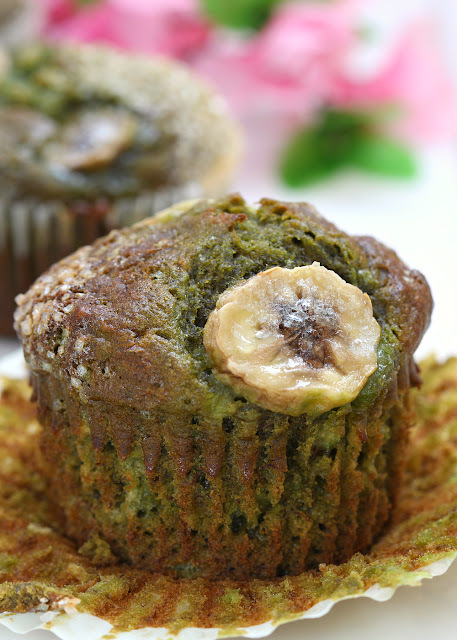 * Spoon mixture into the prepared muffin pan , about three fourths full , top with some banana slices and sprinkle with crystal sugar , if using . * Bake for 20 minutes or until bamboo skewer inserted in the middle comes out clean . Leave muffins for 10 minutes in the pan then take out and let cool completely on a wire rack . 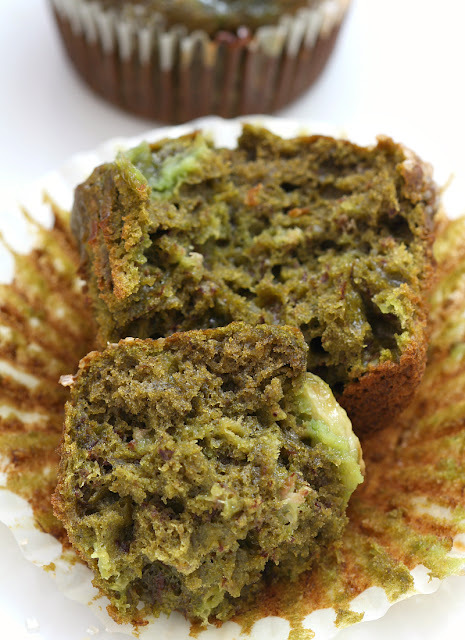 I have never had or baked banana bread with green tea. These look so inviting and good for you too, Anne. How many bananas might that be, roughly, for mashing? Hi Isheng , I used about 4 bananas . 1 cup of mashed bananas is 227 grams .